Teaching was the joy of my life. Having to retire from teaching was the hardest part of becoming ill with Behcets. I was one of those teachers who believed life experiences were the best way to teach kids Reading, Math, English, Social Studies and Science. There were no textbooks in my room. Instead we used children's literature and real life experiences. My classes were known as the Elkhart River Elementary Scientists. The barn owl was locally threatened so the kids spent time learning about it's habitat and what they could do to help the owl. We also dissected owl pellets (Sterilized Owl throw-up, lol) to discover what the owls were eating. A local raptor rehabilitator brought an owl to the classroom, so the kids could meet an owl in person. Since owls are nocturnal we were having no luck seeing them during our weekly field trips to the river. So this layout is from a day in my classroom. To make the Owl Peek A Boo: Cut out 2 owl shadow on the Cricut Give a Hoot Cartridge Size 3. Freehand the velvet paper head tuft feathers. The beak is also free hand. Fold it in two to give it dimension, inking the fold and edges. Cut out the wings and use foam tape on top of the original owl to give dimension and the appearance it is looking over the picture. 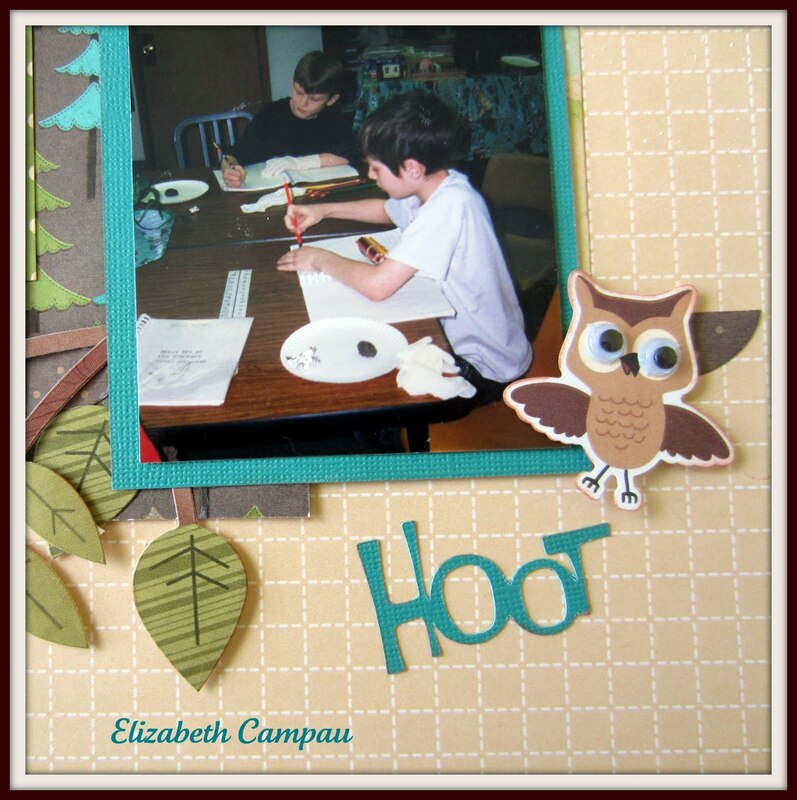 I used foam tape to give the leaves dimension and give the impression that the pictures were up in a tree. 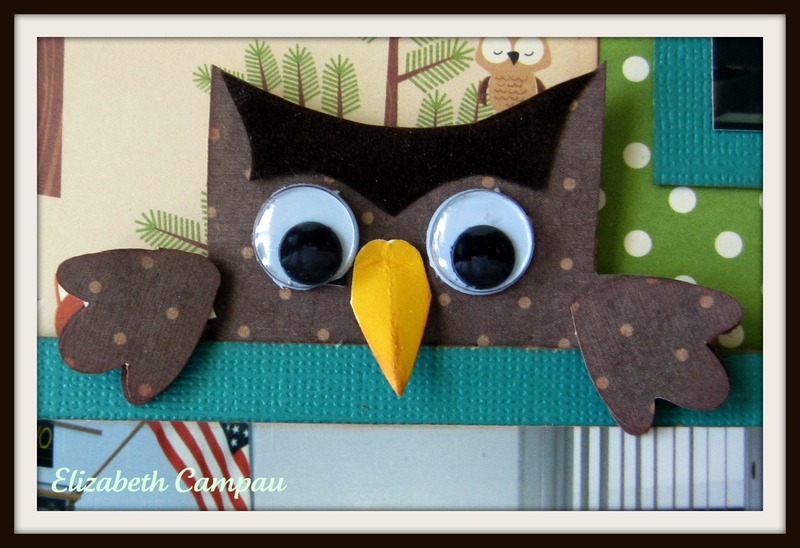 Have a "Hoot" filled day! Elizabeth, what a beautiful layout!! 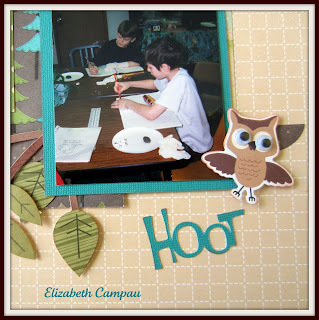 I love, love, LOVE your little owl peeking over the picture like that!! What a creative idea!! wonderful take on the sketch, I love all the pretty details esp the owl! Gorgeous LO...love those owls! Glad you joined us at Cricut360 this week! Awww...that little owl is ADORABLE!!! Thanks for joining us at Cricut 360! So, so cute!!! 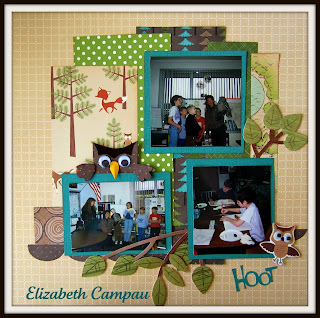 You did a fantastic job on this one Elizabeth!!! Love the owl peeking over the picture!!!!!!!! !